It is now virtually certain that all major world stock markets are in the relatively early stages of a big bad Bear. That bounce may already be underway, with the mid to late January Lows marking a turning point for a upward-leaning grind that could run into May, perhaps even early June. Venus conjuncted Pluto and squared Uranus last week, two strongly negative aspects. This week brings a trine to Jupiter. Given both planets are "benefic" and Earth signs are involved, we could see a level of stability return. 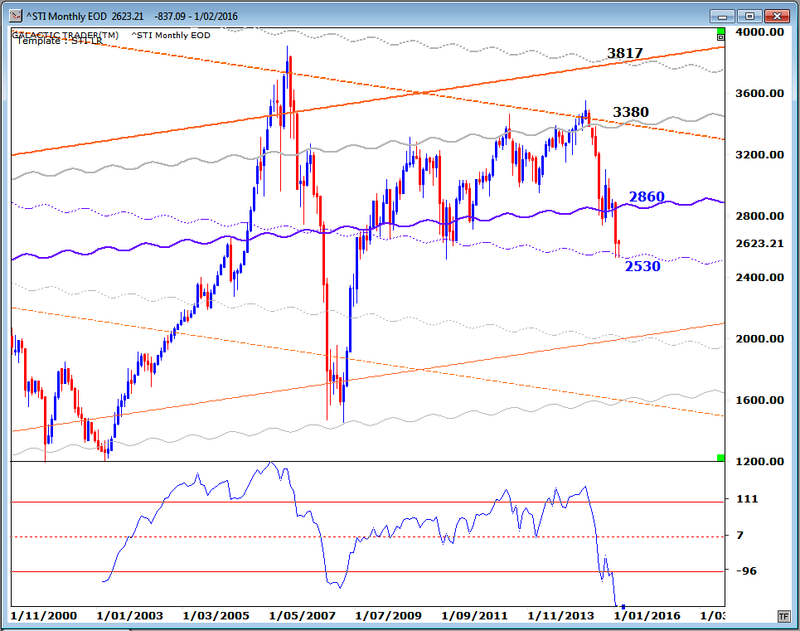 I did promise last month to include the current position of some Asian indices; we'll do that this week, as well as taking another look at Wall Street's SP500 and the ASX 200. We discussed the probability of that in the first two reports for this year, both of which can be accessed via the buttons on the right. There is still a chance that Central Banks will try desperately to stop the drop, but they appear to have exhausted their ammunition. The next major rally is, given the extreme levels of technical damage, most likely to be a dead cat bounce which will provide the last chance for many traders to exit Long positions before being wiped out. The Nasdaq took a major hit last week, with some of the big name tech stocks rolling over badly. These had been helping to hold aloft the entire American market. 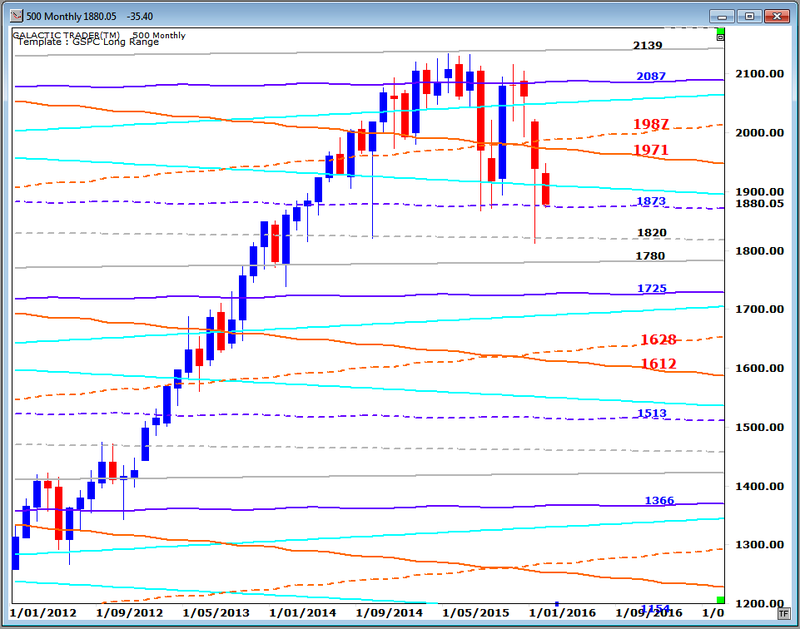 Pollyanna, the SP500, has not yet, I believe, actually confirmed it is now in a Bear market. But that scenario is now leaning heavily towards the probable, rather than the possible. Below is the 500's long-range planetary price chart. The index is still trying to hold the Pluto level in the early 1870s. It is possible a rebound could take price all the way back to the 2080s. Still, long-term history shows it finds strong levels of both support and resistance at those orange Node lines. The Weekly Planets chart for the ASX 200 is below, with the index opening and closing last week's trading within a band between grey Neptune now at 5012 and Uranus now at 4974. 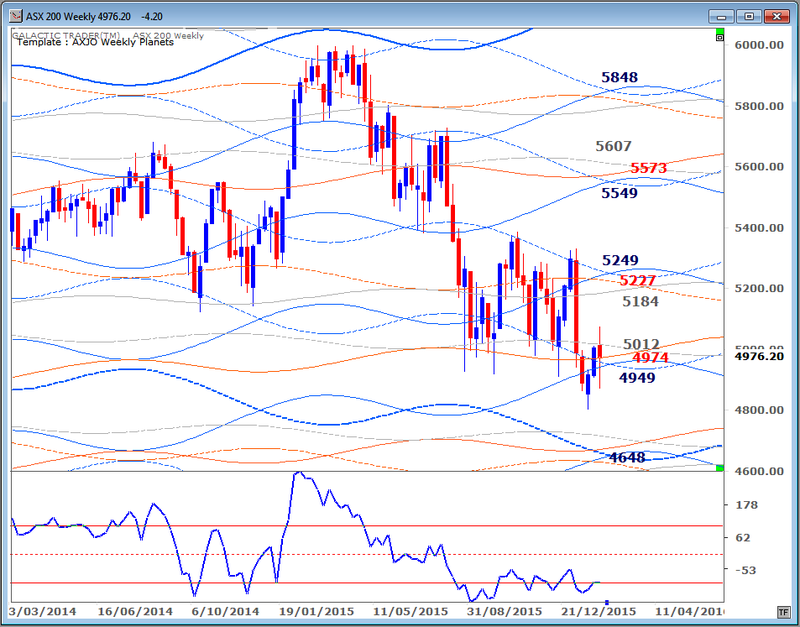 There isn't much to stop a further drop if it dives again below the blue Saturns now converging at around 4949. And any rally is likely to find barriers in the 5184 to 5249 range. India's Nifty is playing very closely to Pluto price lines. 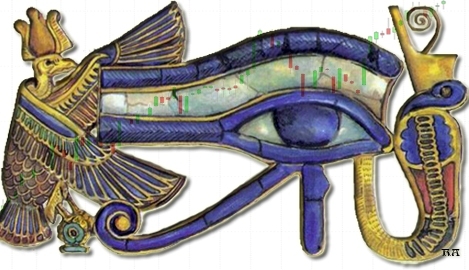 Traders can use these lines as potential targets, keeping a very close eye on daily charts for signs of positive or negative divergence starting to show whenever these targets are approached in actual trading. 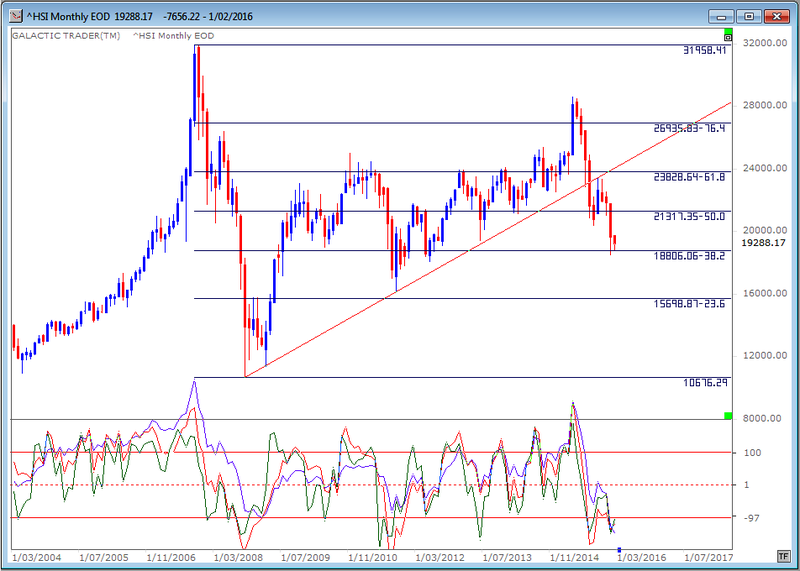 Hong Kong has already fallen off its Bullish trend line ... something which has not yet happened decisively on the SP500 or ASX 200 ... and has also completed a backtest of the line. Big Bird, the 50CCI, is gasping in the dust of the mine floor. There is a little positive divergence in the two faster Birds, giving at least some hope for a bounce "from the obvious" level of Fibonacci support. It's a difficult call, though, since the index is currently stalled below long-range planetary price support. 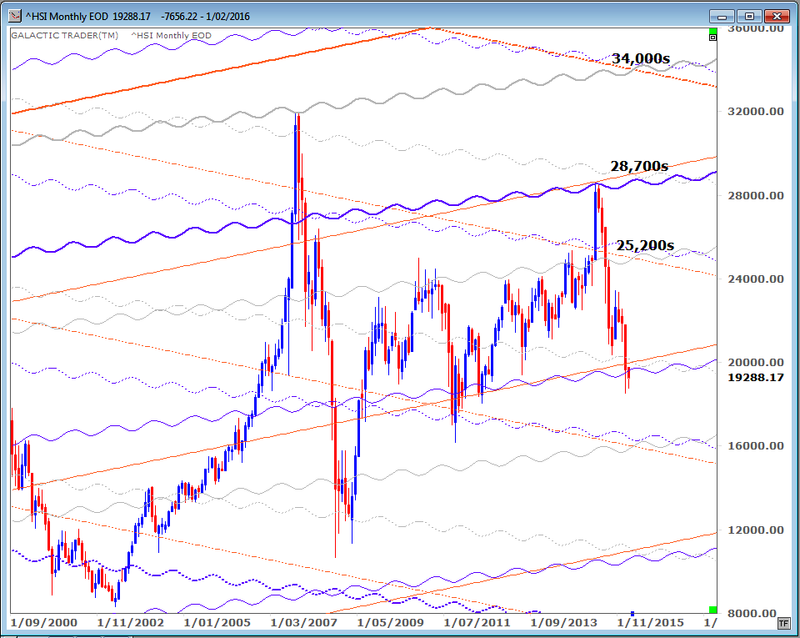 You'll note that in both charts, the next layer of major support doesn't come into force until around 16,000. Singapore is holding up a little more strongly than the Hang Seng at this stage, still just hanging onto planetary support. 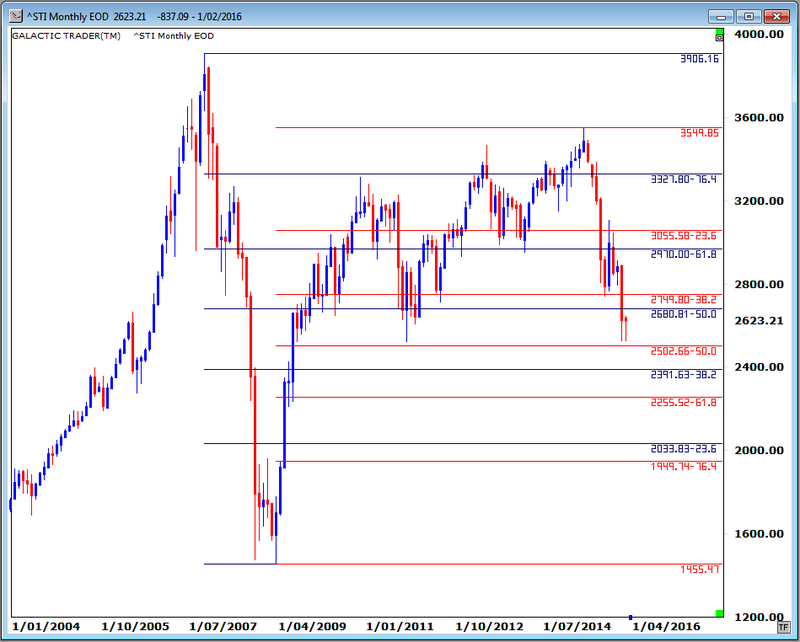 We can see the alternative levels of Fibonacci support and resistance in the chart below. 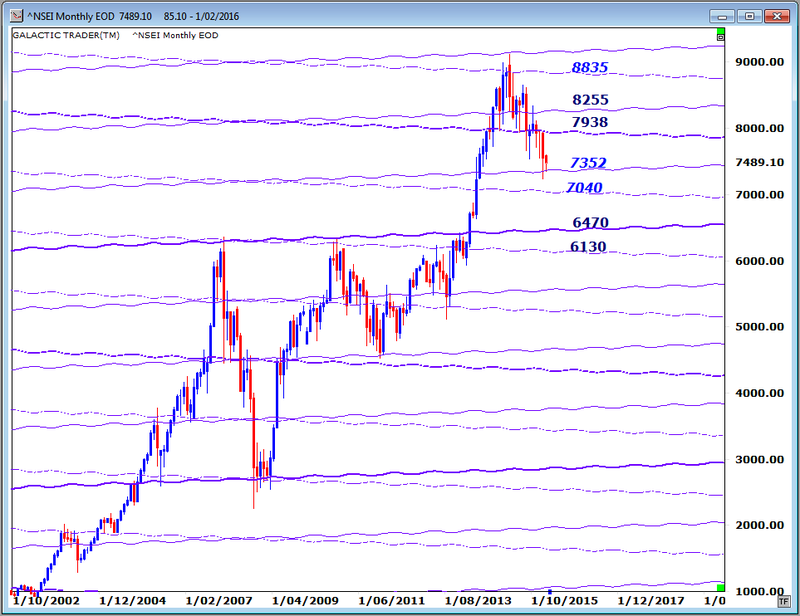 Fibonacci levels and planetary prices will very often be quite close to each other. The black lines are linked to the previous Bull High and Bear Low and the red ones run from the Bear Low to last year's High, and even a quick glance will show you both sets provide a reliable guide to the likely length of rallies and declines. Again, if you're actively trading in these dangerous conditions, use these as a big picture guide and watch the daily charts like a hawk for any potential turn as the prices are approached. If this is a major, new Bear ... and it probably is ... the biggest, nastiest, fastest section of the crash is still ahead of us.